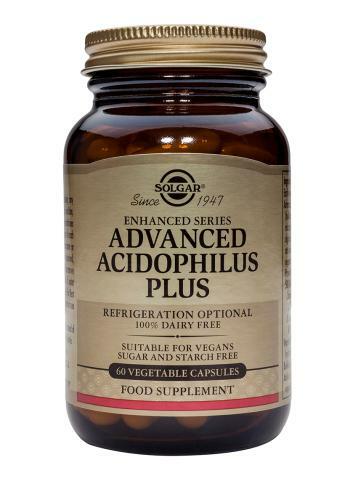 Solgar Advanced Acidophilus Plus (non-dairy) - L-Acidophilus and B-Lactis that survive stomach acidity to help maintain healthy intestine. Providing Specially Cultured Strains of L.Acidophilus and B.Lactis A Source of L. Acidophilus and B Lactis, Beneficial Microorganisms that Survive Stomach Acidity and Naturally Resides in the Lower Digestive Tract to Help Maintain a Healthy Intestinal Flora. Encapsulated with these natural ingredients: dextrose, potato starch, powdered probiotic cultures, microcrystalline cellulose, magnesium stearate. Vegetable capsule shell: hydroxypropylmethyl cellulose. Solgar's Advanced Probiotics utilise a polysaccharide matrix comprised of a specially formulated blend of excipients; this matrix supplies enhanced shelf stability and protects the organisms from destruction when exposed to the stomach acid.